I understand that the lunatics have taken over the asylum. I understand that the Police prioritise attending a racial comment in an email ofer a serious RTA and even an assault. I understand that a husband who is deliberately and regularly unfaithful to his wife in direct breach of the marriage vows he made before his Creator faces no criticism from society. I understand also, that the faithful husband of 24 years, who, while his wife is asleep in another room, throws and smashes a cup in the privacy of his own home, faces being handcuffed, dragged from his home by 3 officers, slammed in a van, locked in a cell where cctv observs his every movement, including observing closely, and full-frontally, when he uses the lavatory. In the morning, he is then handcuffed again, thrown into a van where he has to endure a long journey of sharp bends and even sharper braking, followed by a scary motorway journey swerving between lanes 2 and 3, observing lorries just inches from the small side window he can see out, with his life in the hands of a clearly careless driver, and sitting surrounded by hard steel walls, without the benefit of a seatbelt. Despite his disabilities, he is dragged up and down several flights of stairs at the Magistrates Court, before being sent to the dock, without being granted access to legal advice, to be addressed by magistrates who take no account of his hearing difficulty. I know this, because I threw that cup. I am not proud of doing so. However, I did not hit anyone (either with or without the cup. Nobody was even nearby. The coffee splash will paint over, if it won’t wash off with a damp cloth. Another cup can be bought. Tesco do them at £5 for 4. The scars of the experience at the hands of our Police “service” will not heal. I was going to make a big issue of the matter. I was quite happy to contemplate spending my savings on Lawyer fees, and pursuing the case to the European Court of Human Rights. Then I clicked onto Inspector Gadget’s blog, and read the following. I hope that IG will forgive me copying and pasting it here – I thought of posting a link, but I think it is important that everyone who visits my blog reads it, and I know many links just don’t get clicked. Just read what Northumbria Police have done. What they have done to the parents of a dead girl. The parents of a dead girl who was killed by one of Northumbria Police’s cars, speeding. One of their cars, speeding, without lights or siren. We are told that emergency services drivers are trained to a higher standard. Well, the standard they are trained to is clearly not high enough. Perhaps Nortuumbria Police ought to take notice of the advertisements “Speed Kills”. But it is not the fact that this girl died at the hands of a Police driver that is the point. No doubt the driver is still having sleepless nights. No doubt his scars will also not heal. But what about the scars that Hayley’s parents bear? They will never heal. What parent could face burying their child without being scarred for life. Not burying their child due to a tragic illness. Not burying their child through simple misfortune. But burying their child after that child was killed by the very organisation that is supposed to exist to protect life and property. The scars the Hayley’s parents bear run deep. Now, the very organisation responsible for Hayley’s death has taken a knife to reopen those scars, and cut them deeper. And they have won an award for doing so. Deputy Chief Constable of Northumbria Police, Sue Sim, applied for an award to praise her handling of the media in connection with this incident. Sue Sim should hang her head in shame. In fact, she should resign from her post in shame. I bet Sue Sim doesn’t have sleepless nights. I don’t know how she can live with herself. I guess it is because she has never done anything as shameful as throwing a cup. What I absolutely, completely, utterly cannot understand is how she could contemplate applying for an award for anything connected with causing someone’s death. ………. I read about Northumbria Police and their Deputy Chief Constable, Sue Sim. And about how they nominated themselves and won a public relations award for the way they handled the media after the tragedy of a schoolgirl knocked down and killed by a speeding patrol car. The family of Hayley Adamson, 16, have reacted with anger that Northumbria Police put themselves forward for the prize after the horrifying smash. Hayley, 16, was killed when a speeding patrol car with no blue light or sirens on smashed into her in May 2008. The driver, PC John Dougal, was jailed for three years after being convicted of driving at 94 mph moments before he ploughed into her in the late-night tragedy. How have we arrived at a place where a basic service recovery job with the media, after a fatal POLAC, where one of our officers has effectively killed a young girl for no reason, becomes something we need to be rewarded for, while the family grieve alone? This story says everything about how today’s senior police officers see themselves, what they regard as success (i.e. in how they dealt with the media story) and more importantly, what they really think about “Citizen Focus“. Can you imagine Stockport Council, nominating themselves for an award for how they handled the media over the death of 11-year-old Sam Linton at Offerton High School? It’s unthinkable. Why then, do we do it? Apart from an almost pathological desire to squeeze any kind of praise from even the most appalling mess up, I really cannot fathom the answer. While they keep behaving like that, I will keep writing this, even if it means It all goes horribly wrong for me one day. And in the meantime, for all those members of the public reading, as a police officer, I am personally very sorry for what happened to Hayley, and for the crass actions taken afterwards. I was ashamed about throwing a cup. I was going to keep my shame private. But the shame that Sue Sim should feel for her actions is so incredibly immense that I will speak out. Inspector Gadget speaks out regularly. Read his blog. There’s a link on the sidebar. Two rude, demanding customers at the counter. They have caused problems for themselves, by not bothering to read “No Parking” signs, and not bothering to give us their bank account details accurately, preventing us from paying them back a deposit. They are rude and offensive. It used to upset me. A lot. ow, I have got hardened to it. A lot of customers are the same – then they expect service with a smile. Do they get it? Do I look like I’m bovvered? Sorry – not any longer. 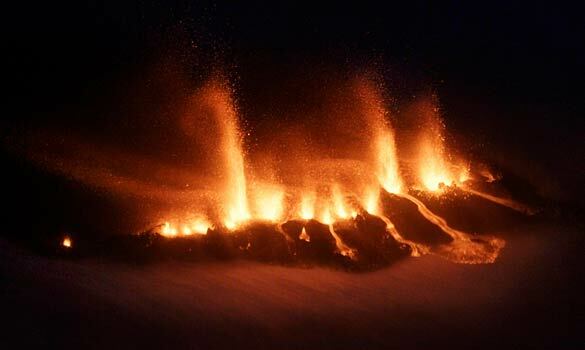 Iceland is preparing for an even more powerful and potentially destructive volcano after a small eruption at the weekend shot red-hot molten lava high into the sky. About 500 people were safely evacuated from the land close to the Eyjafjallajokull volcano, which is around 120 kilometres (75 miles) southeast of the capital, Reykjavik. The country’s two airports were closed for most of the day and transatlantic flights re-routed to avoid the risk of ash blocking visibility and destroying engines. 1. Will the Icelandic people expect help from the UK? 2. Bearing in mind their attitude to the Britich people who lost their life savings in their banks, should we bother to help? 3. If we do help, do you think the Icelandic government will review their attitude about lost deposits? Click photo for a larger image. 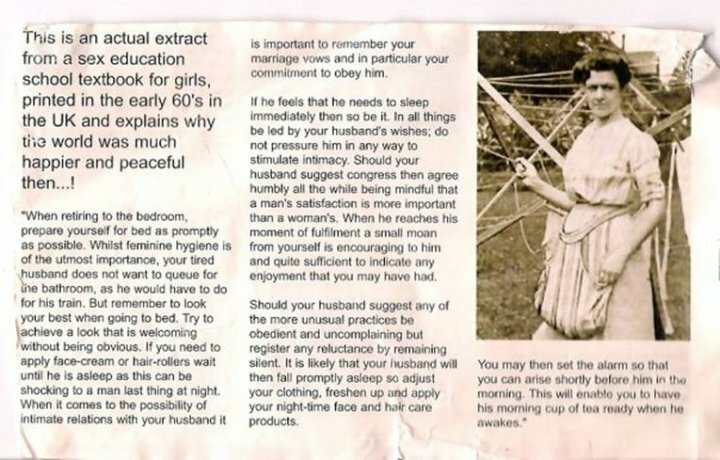 Men – stop laughing. This is WRONG. There are three engineers holidaying in a caravan; an electrical engineer, a corgi (gas) engineer and a Microsoft engineer. Suddenly the water heater stops working and the shower runs cold. The electrical engineer suggests stripping down the electronics of the boiler and trying to trace where a fault might have have occurred. The corgi engineer suggests maybe the gas is not flowing correctly and proposes asking the site warden to change the calor cylinder. The Microsoft engineer, not knowing much about anything, comes up with a suggestion. “Why don’t we close all the caravan windows, get out, get back in, then open all the windows again and then see if it works? Our administration takes these matters seriously and your opinions were heard loud and clear. You will be pleased to learn, thanks to the concerns of citizens like yourself; we are creating a new department here at the Department of National Defense, to be called ‘Liberals Accept Responsibility for Killers’ program, or L.A.R.K. For short. In accordance with the guidelines of this new program, we have decided to divert one terrorist and place him in your personal care. Your personal detainee has been selected and is scheduled for transportation under heavily armed guard to your residence in Toronto next Monday. Ali Mohammed Ahmed bin Mahmud (you can just call him Ahmed) is to be cared for pursuant to the standards you personally demanded in your letter of complaint. It will likely be necessary for you to hire some assistant caretakers.. We will conduct weekly inspections to ensure that your standards of care for Ahmed are commensurate with those you so strongly recommend in your letter. Although Ahmed is a sociopath and extremely violent, we hope that your sensitivity to what you described as his ‘attitudinal problem’ will help him overcome these character flaws. Perhaps you are correct in describing these problems as mere cultural differences. We understand that you plan to offer counseling and home schooling. Your adopted terrorist is extremely proficient in hand-to-hand combat and can extinguish human life with such simple items as a pencil or nail clippers. We advise that you do not ask him to demonstrate these skills at your next yoga group. He is also expert at making a wide variety of explosive devices from common household products, so you may wish to keep those items locked up, unless (in your opinion) this might offend him. Ahmed will not wish to interact with you or your daughters (except sexually) since he views females as a subhuman form of property. This is a particularly sensitive subject for him and he has been known to show violent tendencies around women who fail to comply with the new dress code that he will recommend as more appropriate attire. I’m sure you will come to enjoy the anonymity offered by the burka over time. Just remember that it is all part of ‘respecting his culture and religious beliefs’ as described in your letter. Thanks again for your concern. We truly appreciate it when folks like you keep us informed of the proper way to do our job and care for our fellow man. You take good care of Ahmed and remember, we’ll be watching. Jeremy Clarkson – some straight talking. 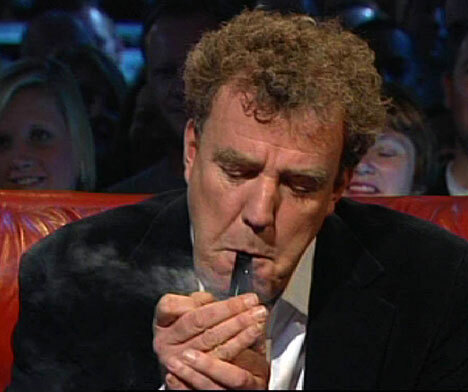 Jeremy Clarkson is sometimes controversial (but that is how he earns a living). However, I have to agree completely with this piece from his column in the Times. It sums up almost everything that is wrong with Britain. As we know, one man once got on one plane in a pair of exploding hiking boots and as a result everyone else in the entire world is now forced to strip naked at airports and hand over their toiletries to a man in a high-visibility jacket. In other words, the behaviour of one man has skewed the concept of everyday life for everyone else. And we are seeing this all the time. Last month a Birmingham couple pleaded guilty to starving their supposedly home-schooled daughter to death. Now, of course, there are calls for parents who choose to educate their children at home to be monitored on an hourly basis by people from the “care” industry, and possibly to have their toiletries confiscated. Then we have calls to ban sexually provocative pop videos from the television until 9pm and put Loaded magazine on the top shelf. Will this prevent teenage boys from seeing girls’ breasts? Well, whoever thinks it will has plainly never heard of the internet. We see the same sort of overreaction to paedophilia. Just because one man in your town likes to watch schoolgirls playing netball, you must apply for a licence if you wish to take a friend’s kids to school in the morning. And I now run the risk of having my camera impounded by the police if I take pictures of my children playing on the beach. Likewise, if I decide to take a picture of St Paul’s Cathedral I will be hurled to the ground by anti-terrorist officers and possibly shot six times in the back of the head — just because one person in Bradford once made a speech about the infidel. We seem to have lost sight of the fact that throughout history 90% of people have behaved quite normally 90% of the time. Agatha Christie, for instance, was home-schooled and at no point was she forced to eat breadcrumbs from her neighbour’s bird table. Of course, at the extremes, you have 5% who are goodie-goodies and who become vicars, and 5% who build exploding hiking shoes and starve their children to death. It’s this oddball 5% that is targeted by the tidal wave of legislation. But making it more difficult to teach your children at home will not stop kids being mistreated. It just changes the pattern of everyday life for everyone else. This is what drives me mad. We now think it’s normal behaviour to take off our clothes at an airport. But it isn’t. Nor is it normal to stand outside in the rain to have a cigarette or to do 30mph on a dual carriageway when it’s the middle of the night and everyone else is in bed. It’s stupid. And last week the stupidity made yet another lunge into the fabric of society with the news that government ministers were considering new laws that would force everyone to take a test before they were allowed to keep a dog. No, really. Because one dog once ate one child, some hopeless little twerp from the department of dogs had to think of something sincere to say on the steps of the coroner’s court. Inevitably, they will have argued that the current law is “not fit for purpose”, whatever that means, and that “steps must be taken to ensure this never happens again”. The steps being considered mean that every dog owner in the land will have to fit their pet with a microchip so that its whereabouts can be determined from dog-spotting spy-in-the-sky drones, and that before being allowed to take delivery of a puppy, people will have to sit an exam similar to the driving theory test. The cost could reach £60, and on top of this you will need compulsory third-party insurance in case your spaniel eats the milkman. So to ensure that someone in the north called Mick doesn’t shove his pit bull into a primary school playground to calm it down, I will now have to computerise my labradoodle and answer a lot of damn fool questions about when my dog should be on a lead. In other words, the normality of dog ownership will be skewed. Instead of spending your free time with your pooches, throwing balls or tickling them under the chin, you will be forced to provide tea and biscuits for someone from the department of dogs while he inspects your cupboard under the stairs for evidence that they’ve eaten the cleaning lady. This will achieve nothing good. It will ruin the enjoyment of dog ownership for millions, it will result in thousands of abandoned dogs, as people realise they can’t afford the insurance, and yet it will make no difference to men in the north called Mick, who will continue to tattoo their dogs with gothic symbols of hate. What good did all the airport legislation achieve? None. It simply means that you and I now must get to the airport six years before the plane is due to leave and arrive at the other end with yellow teeth, smelly armpits and no nail file. Did it prevent a chap from getting on board with exploding underpants? No, it did not. Happily, however, I have a solution to the problem, a way that normal human behaviour can be preserved. It’s simple. We must start to accept that 5% of the population at any given time is bonkers. There are no steps to be taken to stamp this out and no lessons to be learnt when a man with a beard boards a plane with an exploding dog.